A distinctive characteristic of a Bates education is the emphasis on student research. At Bates every student is a scholar: We expect students to develop the skills and background they need to undertake ambitious research projects. Opportunities throughout a Bates career introduce students to research so that by senior year, they have the confidence and expertise to embark on a senior thesis or capstone project, guided by committed faculty mentors. 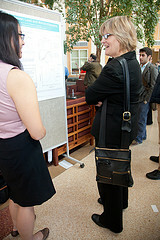 Students are encouraged to present their work and hundreds do so at the annual Mount David Summit. In the Honors Program, selected seniors undertake yearlong thesis research and prepare an oral defense for specialists in their field. Students with strong academic records are also encouraged to compete for prestigious graduate fellowships like the Rhodes, Fulbright, Marshall, and Watson. Click below for information on these programs.